The 2019 presidential campaign is gradually winding down. By the guideline provided by the Independent National Electoral Commission (INEC), all campaign activities by political parties must end 72 hours before the election day. In any clime, electioneering has always been the most laborious aspect of the poll processes. Nigeria is no exception. Apart from the enormity of financial resources required for logistics, it is also a testing ground for candidates’ popularity and acceptance by the electorate. 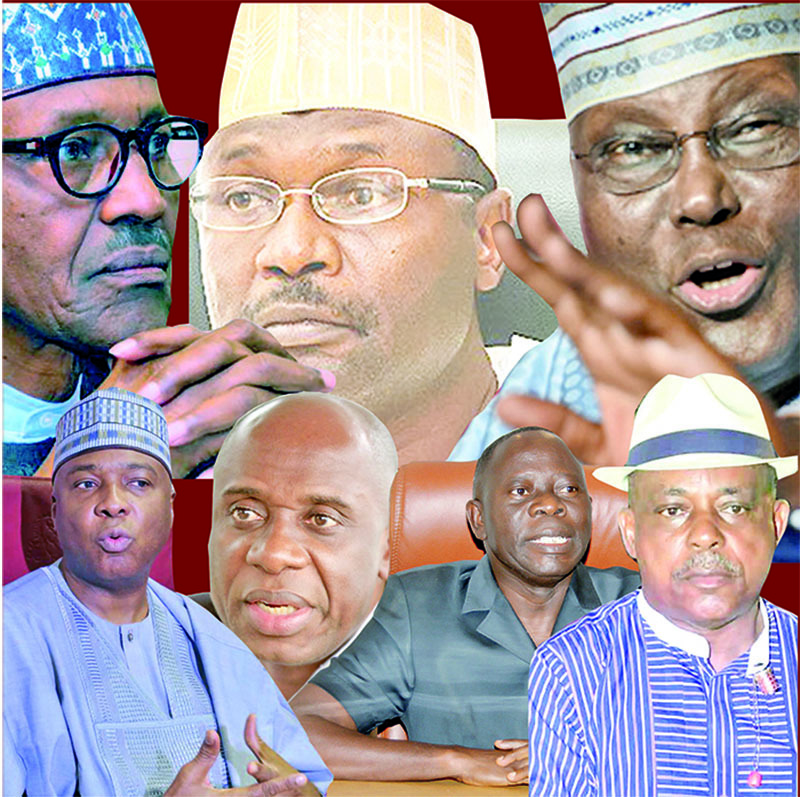 Contrary to the euphoria that heralded the flag off of this presidential campaign some weeks ago, only the presidential candidate of the All Progressives Congress (APC), President Muhammadu Buhari and his counterpart in the opposition Peoples Democratic Party (PDP), Atiku Abubakar, are the last men standing. A few others who are still in the race are playing only the sideline role, perhaps, due to financial limitations. Many of them could not even move out of their enclaves for rigorous field campaigns. In some instances, their posters are scantily visible. For the ruling APC, enthusiasm is still very high among its teeming supporters. Everywhere they went, President Buhari was greeted with intimidating crowd, which according to the party faithful, is an indication that their candidate still commands the goodwill of the electorate. A number of factors have contributed to the success of Buhari campaign exercise. One of these is the advantage the APC has in controlling the largest number of states. At present, the party controls 23 states out of the 36 states of the federation. These include: Adamawa, Bauchi, Edo, Imo, Jigawa, Kaduna, Kano, Katsina, Kebbi, Kogi, Lagos, Nassarawa, Niger, Ogun, Osun, Oyo, Ondo, Ekiti, Plateau, Sokoto, Yobe and Zamafara states. Kwara, Benue and Sokoto were formerly under the control of APC. However, with the recent wind of defections that hit the party, governors Abdulfatah Ahmed, Samuel Ortom and Aminu Tambuwal respectively have abandoned the party for the PDP. Even at that, the teeming crowd that witnessed the campaign rally in these states showed that APC is still a force to be reckoned with in them. For those other states, the governors in charge didn’t spare any of the resources available at their disposal to organize a rousing welcome for the president. By the same token, they will surely not want to leave any stone unturned to ensure the victory of the party and their candidates in the coming election. Except for Cross River and Akwa Ibom states, where APC is recently making some inroad with the defection of Senator Godswill Akpabio, South-South still remains largely an impregnable fortress for the party. So also the five states in the Southeast, but Imo. By implication, if the APC is able to sustain its stronghold in the Northwest, Northeast and Southwest in the coming election and also make appreciable showing in Akwa Ibom, Cross River, and some parts of the Southeast, Buhari may still retain the power in 2019. So far, concerned governors have demonstrated that they are in firm control of their states. Even in Kano State, where Governor Abdullahi Ganduje has been in the eyes of the storm for alleged bribery scandal, the unprecedented crowd that greeted the President during the state rally showed that APC is still a party to beat in the state. For the Northeast, the bigwigs like Buba Marwa, former EFCC chairman, Nuhu Ribadu, are working round the clock to see that the election is an easy walkover for Buhari. As a demonstration of his commitment, Marwa had just recently led some 71 retired army Generals to Aso Rock to declare their support for President Buhari’s re-election bid. Direct connection, of the Federal Government’s intervention programmes like N-power, school feeding, conditional cash transfer to the vulnerable, tradermoni to the ordinary people, has also helped to shore up the confidence of the electorate for the Buhari administration. Under the N-power programme, not less than one million graduates have been engaged as teachers in various schools. The initial take off figure of the beneficiaries was 500,000. This was subsequently increased to one million shortly before the commencement of the campaign. As safety net, another one million people are also benefitting from conditional monthly cash transfer of N5,000 to the extremely poor segment of the society. The most recent of all is the tradermoni which the opposition party has described as vote-buying stragedy of the APC. Although these expenditures are said to have been captured in about half a trillion naira 2016 appropriation, as government claimed, many people are wondering why some of the programmes suddenly became full blown at the peak of electioneering. With its trickledown effects, no doubt, one or two of the relations of the beneficiaries would want to support the present administration for the continuity of the programmes. Apart from this, the government also has a good parade of infrastructure development cutting across the six geo-political zones. Most of these were well captured in the 2019 budget presentation to the National Assembly. These, according to President Buhari, include: the completed and commissioned Abuja – Kaduna Rail Line, Abuja Metro-Rail Project, Itakpe-Ajaokuta-Warri Rail Line now undergoing test runs, Lagos – Kano rail line, as well as Lagos to Ibadan segment of the project under construction. On road infrastructure, he said: “In 2018, an additional 1,531 kilometers of roads have been constructed and 1,008 kilometers rehabilitated across the country. Priority projects such as the Abuja – Kaduna – Kano highway, as well as the Second Niger Bridge are well underway through the Presidential Infrastructure Development Fund. His words: “In the North Central, long neglected roads like the Ilorin – Jebba Road, a stretch of 93 km that took a number of days to travel had been completed to provide a critical link between the Northern and Southern parts of the country over a few hours. “In the South-South, we have recently completed the 60 km section of Alesi to Ugep in Cross River State, and awarded the 72km section from Odukpani Junction to Ugep which will reduce a journey that used to take three days a few years back, to 3 hours. “Work has also commenced on the Calabar – Itu – Odukpani Road that links Akwa-Ibom to Cross River State, as we have started work on the long-neglected Bodo – Bonny Bridge to connect these long separated communities. “In the Southeast, a critical section of Umunya linking Awka to Onitsha, a stretch of 18 kilometers, is being constructed now and one side of it should be ready for use before June 2019. Roads like Arochukwu – Ohafia – Bende are also receiving our attention. “In the Southwest, long neglected and abandoned roads like the Badagry Expressway have been awarded for construction along with the Apapa – Tin Can Island, Mile 2 – Oworonshoki, road to ease the congestion currently being experienced in Lagos, while interstate roads linking Ogun through Ikorodu to Sagamu, and Ipaja to Otta and Abeokuta are being repaired with payment to contractors. “In the Northwest, we have completed the Sokoto to Tambuwal – Jega Road comprising 135 Km out of the entire Sokoto to Yauri stretch and sections of Kaduna Eastern bypass and Kano Western bypass are also progressing. “In the Northeast, we have started work on the long-neglected Mayo – Belwa – Jada Road, and the Gombe – Numan – Jalingo Road and recently awarded the reconstruction of bridges damaged by insurgency,” he said. Berating the PDP for its alarm on the alleged plot by the APC to rig the coming election, he added: “We are all Nigerians. We have all been in this country in the last 19 years or thereabout since we returned to democracy. And Nigerians know who have been rigging elections. Nigerians know that PDP is the greatest rigging machine that ever existed on earth. One of the major snags of the Buhari administration is the public resentment of the perceived lopsidedness in political appointments. Many people have expressed displeasure for favouring the North at the detriment of other regions. For instance, some of his critics have blamed the issue of herdsmen/farmer clashes on his appointment of only Northern officers as Chief Security Officers, accusing him of promoting ethnic agenda. Boko Haram insurgent attacks, economic hardship, rising level of poverty, youth unemployment, among others, are some of the challenges the administration has had to grapple with since it came on board in 2015. Economy, security and anti-corruption war are the three-pronged agenda of the Buhari administration. Now that another election is here, it is left for the electorate to decide how well President Buhari has fared in terms of delivering its electoral promises and whether or not they can still trust him for another term of office.